Chicago Floral and Event Design. Create. Share. Inspire. Tammy and I had the pleasure of meeting with Kristina Carter, owner of Vrai Photography last week. We talked for quite some time and shared views on business and green initiatives in the special event industry. Kristina is a charming and truly talented photographer with a passion for spreading the word about all things “green”. Kristina emphasizes customer experience as a key element of her services and her artful eye and photographic technique capture memorable moments in a truly unique way. We are thankful that Kristina has taken the time to post a wonderful vendor spotlight post about Flowers With Feeling, Inc. (http://vraiphoto.blogspot.com/2009/04/impact-tipvendor-spotlight-flowers-with.html). You can find out more about Kristina’s work at her website at http://www.vraiphoto.com or the Vrai Photography Blog at http://www.vraiphoto.blogspot.com/. Whether your vision is classic or contemporary, creative and affordable lighting options can add vitality and ambiance to your event and give even a modest centerpiece depth and vibrancy. LED lighting (light emitting diode) is more widely available than ever before and in many forms and colors. In many cases brides and event designers are opting to replace traditional candles with equally affordable eco-friendly LED or combining LED with traditional or soy candles. Our featured design (right) by Flowers With Feeling, Inc. Chicago, illustrates the combined use of both LEDs and traditional floating disk candles. One of the clear advantages of using this technique is the dynamic feel and movement of flickering candlelight in combination with the warmth and color of the LED. In this example, blue LED lights are masked beneath a soft cloud of white chiffon. This somewhat traditional wedding centerpiece is brought to life by incorporating elements which by themselves might appear one dimensional but together result in a dynamic multi faceted presentation. On Saturday, March 29, 2008, from 8:00 PM – 9:00 PM, Chicagoans will join together in a collective effort during Earth Hour Chicago 2008 to illuminate the effective impact of even the smallest individual contributions to reduce energy consumption and greenhouse emissions. For one hour, between 8:00 – 9:00 PM, residents of more than 20 cities around the world are being invited to take part by switching off lights and turning off appliances. The concept which originated in Sydney Australia in March, 2007 is being embraced by Chicagoans and by participating cities around the world including Bankok, Copenhagen, Melbourne, Manila, Tel Aviv and Toronto. Avenue M Restaurant and Lounge at the Allerton Hotel is offering an Earth Hour menu prepared without the use of heat or energy. Fabulous offerings and specialty cocktails enjoyed over candlelight are sure to make Earth Hour a memorable experience. These special items will be available throughout the evening. InnBar at the Inn of Chicago will host candlelight cocktails from 8:00pm-9:00pm. Join us all night for our highly anticipated Eco-Tini (made with organic vodka and raspberries) and a selection of organic beers. Chris Gelbuda will be performing at 7:00pm, acoustically of course! Soy candles will illuminate the swanky scene provided by Flowers with Feeling. Winners at the Chicago City Centre is proud to offer a selection of organic beers and spirits to encourage our guests to get in the true spirit of Earth Hour. Soy candles, provided by Flowers with Feeling will again set the mood in an eco-friendly way. Earth Hour 2008 will begin in Christchurch, New Zealand and will cascade through 14 time zones including participating U.S. cities Phoenix, Atlanta San Francisco and Chicago. This dramatic and symbolic initiative is yet another step in Chicago’s ongoing commitment to being one of the greenest cities in the nation. Visit http://www.worldwildlife.org/ or http://www.earthhour.org/ for more information. With the emergence of all things green, some are left to wonder how to incorporate eco-consciousness into the fabric of their lives. For many, the decision to make eco-friendly choices is directly affected by the effort necessary to make a contribution. In a result oriented society, some find it difficult to make decisions which, by themselves, seem insignificant. Weddings and events offer the ideal opportunity make a contribution with minimal effort. In the special event / wedding design industry, this budding concept has been widely embraced. With nearly 2.3 million weddings projected nationwide in 2007, many small contributions can clearly make a significant impact. One popular choice being made by Chicago brides is the use of recycled glass vases. Recycled glass vases, often used for centerpieces and wedding reception décor, are widely available in hundreds of forms, shapes and colors to accommodate a wide range of style and budget needs. Recycled glass bowls, bottles or platters paired with seasonal organic, hand picked or locally grown floral can add the perfect finishing touch to any holiday table. Growers of organic and transitional organic flowers, once overshadowed by the more abundant organic produce growers, now make available an ever expanding selection of “green” botanicals to complete your eco-friendly design without compromising style. From Roses to Calla Lilies, rustic to formal, eco-friendly floral selections are more readily available than ever. Recycled glass vases can be recycled an infinite number of times without loss of quality, require considerably less energy to process and conserve natural resources. Recycling a single glass vase saves enough energy to operate a television for 90 minutes. To put this in perspective, if each 2007 wedding chooses to recycle just one vase, enough energy would be saved to operate a single television continuously for nearly 400 years. Whether planning an elaborate wedding or simply sending a floral arrangement to someone special, making eco-friendly choices is easier than you might think. For more information on recycled glass vases and organic flowers for your next event call Flowers with Feeling at 312-829-1141 or visit them online at http://www.flowerswithfeeling.com/. In an increasingly eco-conscious society, special events are following suit by going green. In contrast to many overtly themed events, green theme events can be somewhat more subtle but no less engaging for partygoers. Green events are more about creating a socially conscious undertone, a common thread that begins with the invitations and ends with the parting favor. Read Sara Snow’s post “After the Green Wedding” for an excellent example. One increasingly popular component to Chicago area “green events” is organic or transitional organic Veriflora certified floral products. Most associate “organic’ with food products, but many flower farms are transitioning to crop production practices that build soil fertility and control pests without the use of dangerous farm chemicals. The approach, however, extends beyond the field including improved working conditions, storage, packaging and transportation techniques. The QAI Certification Program is designed to certify every step of the organic chain: from the land on which the product is grown; to the producers growing the product; to the post-harvest facilities preparing the product; to the processing and handling facilities transforming the product. This includes the use of sustainable farming techniques that rely on natural systems of production, pest management, and weed and fungal control, such as: cover cropping, composting, beneficial insect release, crop rotation, and prohibited use of genetically modified organisms (GMOs). It also prohibits the use of toxic and persistent chemicals commonly found in industrial pesticides, herbicides, and fungicides. The purpose of organic agriculture is to enrich the soil, minimize damage to ecosystems, conserve biodiversity, and maintain environmental quality. Flowers With Feeling, Inc. offers the finest floral products sourced from growers that are committed to the highest social and environmental standards. Our certified floral selections are grown and harvested using practices that aim to improve the quality of farm working conditions, minimize damage to ecosystems, conserve biodiversity, and enhance environmental quality for future generations. Ask your Flowers With Feeling representative for more information about “green event” ideas and product availability or visit us on the web at www.flowerswithfeeling.com. We all love candlelight, right? It’s romantic. It makes us look younger and more beautiful. Team it with the right bottle of wine and anything can happen… Now we can team our love affair with candlelight with our love for the environment. Thanks to nature’s cute, little soybean, there are many candles on the market for environmentally conscious consumers. Unlike paraffin wax based candles, 100% soy candles burn cleaner. They don’t produce the soot residue and carcinogens that you find with paraffin wax and they are made with cotton wicks rather than lead. This healthier alternative will keep the air in your home as well as your walls, ceiling and furniture cleaner. Consumers also have the added benefit of knowing that they can help support the American farmer. Consumers can purchase candles made from soybeans harvested right here in the Midwest, grown by farmers in America’s heartland. So the next time you’re thinking of adding a little romantic ambiance with some candlelight, share the love with mother earth and light a soy candle. Consider using soy candles for your next green event. What could be greener? For more information or for assistance with designing your next event email jennifer@flowerswithfeeling.com or call 312-829-1141. 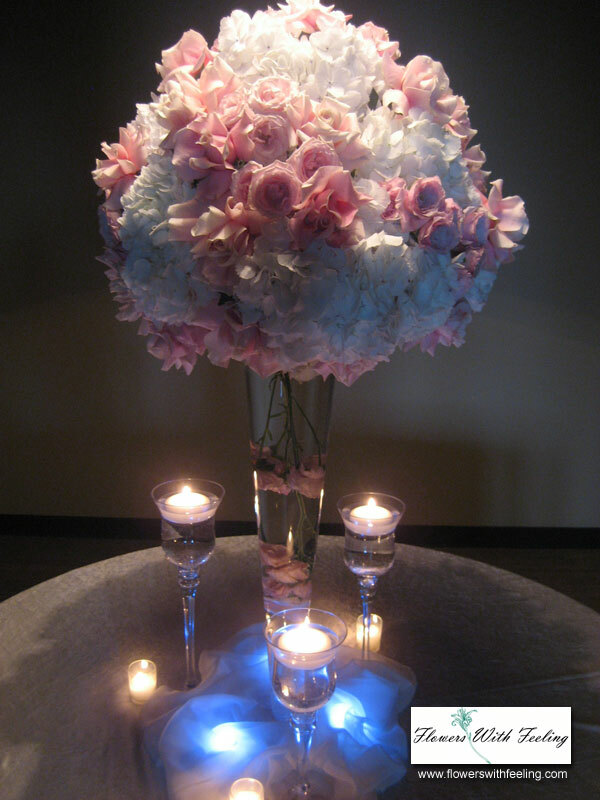 Flowers With Feeling, Inc. Chicago: Floral / event design and plant rental for weddings, conventions, meetings and more. Visit www.flowerswithfeeling.com. If you recently planned a wedding, bar/ bat mitzvah, gala or corporate event you have probably googled for ideas a time or two. The internet age has made special event trend spotting and trend setting a fast paced fluid process. What was once the trend of the year has become the trend of the moment. Corporate party goers are looking for fresh engaging environments that transport them or envelope them with a feeling. Party throwers, planners and florists like Flowers With Feeling, Inc. Chicago are faced with the challenge of keeping a watchful eye on the moving target that is the ‘latest thing’. Social and corporate event clients alike are embracing the latest ‘latest thing’ , environmentally conscious flowers and decor. This thing called green, however, is here to stay. While the use of recycled paper invitations, e-vites, vintage wedding dresses versus new and recycled glass centerpiece containers are well known green options, flower growers from around the world are now establishing stringent guidelines and implementing practices that are both environmentally and socially responsible under the Veriflora certification. Organically grown flowers are currently available from many local growers and farmers markets and are expected to be more widely available later this year. Typically, theme events like bar-bat mitzvahs rely heavily on visual cues to invoke emotion and to convey the given theme concept. When it comes to green events, less is more. A recent example of a subtle eco-conscious bar mitzvah designed by Flowers With Feeling, Inc. in association with Chicago party planner Joyce Feuer, utilized reusable recycled glass vases, recycled paper invitations and featured pruned cherry blossom branch centerpieces, reusable glass votives wrapped in green Magnolia leaves, river rocks and other locally grown replenishable natural elements (Location: Sofitel Chicago Water Tower). Events of all types can incorporate this principal without compromising the overall vision. Ask your florist or party planner about green decorating options. For more information about green products and ideas for your next meeting or event contact Flowers With Feeling, Inc. Chicago (312-829-1141). 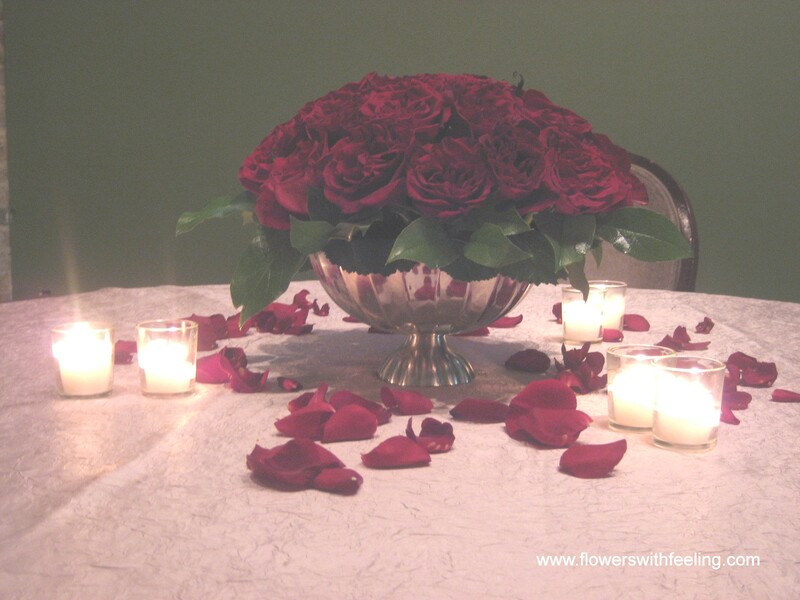 View Flowers With Feeling, Inc. floral, wedding and special event designs by venue locations throughout the Chicago area.